A private 1,800-acre gated community set in rugged desert foothills high above the azure-blue waters of the Sea of Cortés, Querencia, established in 2000, is embellishing its reputation as one of México’s finest residential clubs. Under new ownership since August 2017, Querencia (loosely translated as “sanctuary”) has committed $60 million to a wide range of renovations and enhancements throughout the entire property. The club invested $1 million in new golf maintenance equipment last year and has earmarked an additional $2 million to upgrade the playing surfaces on its award-winning course. 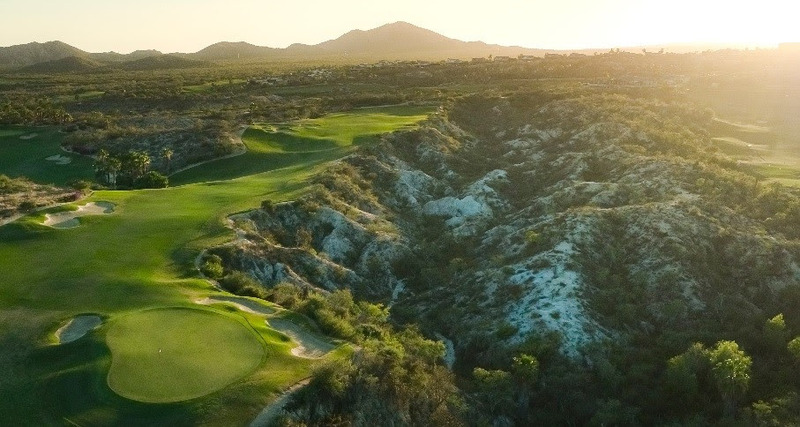 Designed by Tom Fazio and recently voted to Golf Digest’s roster of the “World’s 100 Greatest Golf Courses,” Querencia takes players on an upcountry roller-coaster ride across steep hills and bluffs, with several holes skirting deep canyons and arroyos. The well-groomed course is known for its smooth, fast greens, superb collection of par 3’s and stellar ocean views. Seven tee placements, including mix ‘n match combo tees for men and ladies, give Querencia excellent versatility, a Fazio trademark. Work began this month on a major turfgrass overhaul of several fairways. “Our members want playability and an aesthetically pleasing presentation,” said Jorge Carrera, Querencia’s CEO. Selected fairways are being sodded with 328 Bermuda grass to replace the original 18-year-old playing surfaces. Durable and resilient, this dark green, drought-resistant hybrid is known for its fine texture and soft blades. The greens will retain their TifEagle Bermuda grass surfaces. In addition to irrigation and drainage upgrades, the club is amending its fairway subsoils to sustain healthier turfgrass. A new landscaping scheme will introduce colorful flowers around the perimeter of tee boxes. Course enhancements are expected to be completed by next year. While acknowledging that golf is “a big draw—in fact the biggest draw” for current and prospective members, Carrera noted that an absence of real estate inventory has led to the creation of several new residential projects at Querencia. Moreover, the new owners, the McCloskey family of Aspen, Colo., have embarked on a series of initiatives designed to position Querencia as a family-friendly, multi-generational club, with a focus on health and wellness offerings as well as cultural and physical pursuits. “Cabo remains one of the world’s top vacation destinations and hottest resort communities in the world,” said Ryan Elston, president of real estate at Querencia who, along with his wife, Lauren McCloskey Elston, are part of the new ownership group. “We continue to see a steady uptick in real estate investment and realize the tremendous growth opportunity for Querencia,” he said. The clubhouse at Querencia, at 58,000 square feet one of the largest and best-appointed in Los Cabos, has three re-themed restaurants, a full-service spa, a top-notch fitness center, a dedicated children’s area, and multiple pools, including a rock-lined lap pool and an infinity-edge pool with waterslide. Enhanced communal spaces now have a brighter, more contemporary look and feel. Catering to a younger demographic, Querencia will soon debut over six miles of new “Dirt Surfer” single-track and mountain bike trails, a unique amenity in Los Cabos. The trails flow downhill to the crown jewel of the club’s new offerings, the Q Beach Club. Set on a bluff above Acapulquito Beach, one of Cabo’s best surf breaks, this exclusive 1.5-acre enclave offers a casual outdoor bar and dining area, private beach cabanas and shady hammocks. The Q Surf Club provides equipment and instruction for a wide array of water sports, from stand-up paddle boarding and snorkeling to fishing and surfing. It’s also become a favorite 19th Hole for golfers. Future plans call for oceanfront real estate offerings. Located on the outskirts of San José del Cabo, a quaint colonial town circa 1730, Querencia is conveniently located 15 minutes from Los Cabos International Airport (SJD). The luxury golf and residential community is less than a two-hour flight from many major U.S. cities. Press release from Brian McCallen, Golf Public Relations for the Los Cabos Tourism Board.